Whinny Farms Horse Training - Home of the "Foundation Education"! To your horses personal training page where you can watch your horse’s progress as we train them. In developing a mental connection with your horse, we are waking up the horses mind and getting them thinking and learning with us. Coming 2yrs old - it's time to be caught up & brought in for her halter breaking & establish her Foundation Education! Not too sure about catching & leading...but she's doing VERY well & is a fast learner! Learning to drag a line, this helps reduce panic considerably if they get in a pickle later on as a saddle horse. Another "giving" exercise...asked to give her body, she does, and finds quick relief ~ Good Girl! 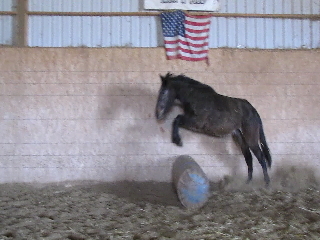 Asked to trot over a pole that's placed on a noisy tarp - she does it! 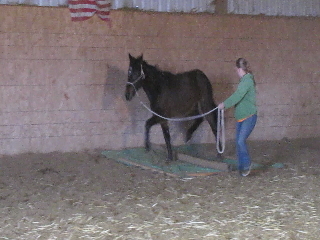 Video of Belle trotting across the tarp ~ very well done for just recently learning to send! 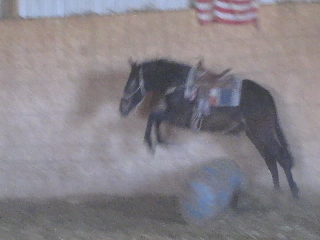 Video stills of Belle free-jumping the barrels, then doing it again tacked western! This quick video shows Belle free-jumping barrels, tacking up western, and free-jumping them again!